OK so guys I wanna ask you this – how are your kids with eating fruits and vegetables? I gotta keep trying though! I myself like vegetables but as a child I didn’t, and only ate them cos I lived in fear of the wrath of Mummy Ooi hahahaha. Fatty on the other hand is super picky when it comes to veggies and fruits, only eating leafy vegetables, and that’s a habit I’m trying to avoid with our kids. I heard somewhere that kids need to eat something seven times on average before they accept it so… challenge accepted. Here’s my three proven techniques of getting kids to eat their greens. I half feel that a basic foundation to be Secretary of State you gotta go through training of persuading toddlers to do things they don’t want first hahaha. Anyway the first step is always negotiation. How many times already I’ve made Fighter try some food only to have him like it, but he still NEVER GIVES IN. Every time is a new battle with me going, “One bite. Just one bite. If you don’t like it, you can spit it out.” And he’ll be shaking his head vigorously and clamping his lips wtf. This works half the time though. And when he does take the bite, half the time he likes, it half the time he doesn’t. I’ll take whatever wins I get. Did you know that our recommended fruit and vege intake is 2 servings a day? 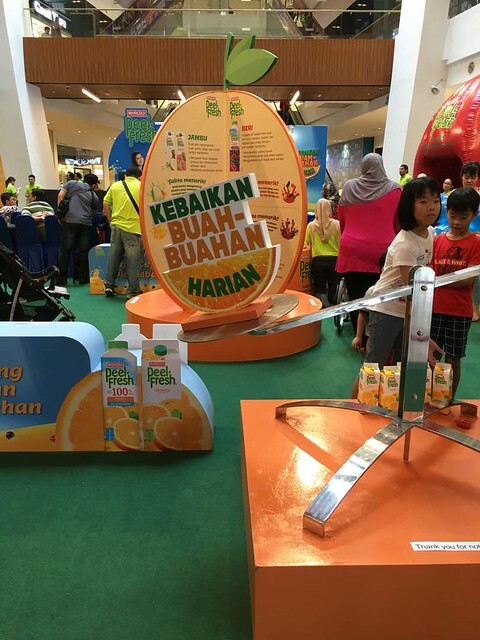 And only 6% of Malaysians get enough fruits and greens? To supplement the critters’ (and Fatty’s) intake, we normally have juice in the morning – either freshly pressed or juice boxes like from Marigold Peel Fresh. 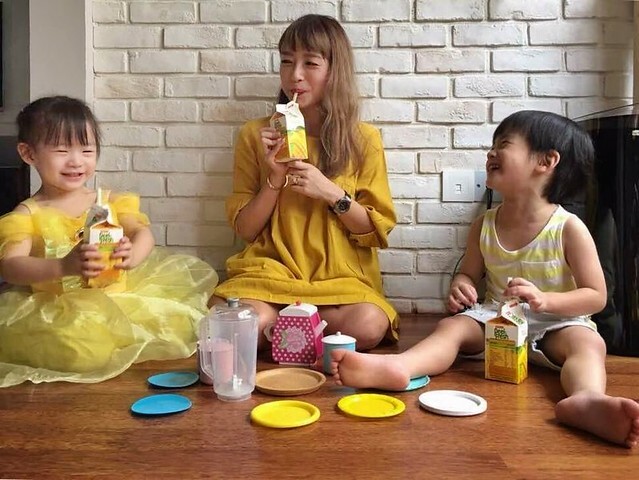 The kids are perfectly willing to drink juice cos they love sweet drinks and I’d much rather feed them juice than soda. And I was invited to speak at the Peel Fresh Daily Fruit Goodness roadshow last weekend! From the point of view of a mom with two toddlers (and a picky husband lolol). With fellow blogger Lizzie, and Nazrudin and Lisa Surihani!!! I don’t even follow local entertainment but I was starstruck anyway hahaha cos they were all so eloquent and intelligent and warm. We’re all parents so I found our discussion about kids and healthy eating pretty interesting and insightful. Thank you MARIGOLD Peel Fresh for having me! Like this mini golf game where you hit an orange instead of a golf ball lol. 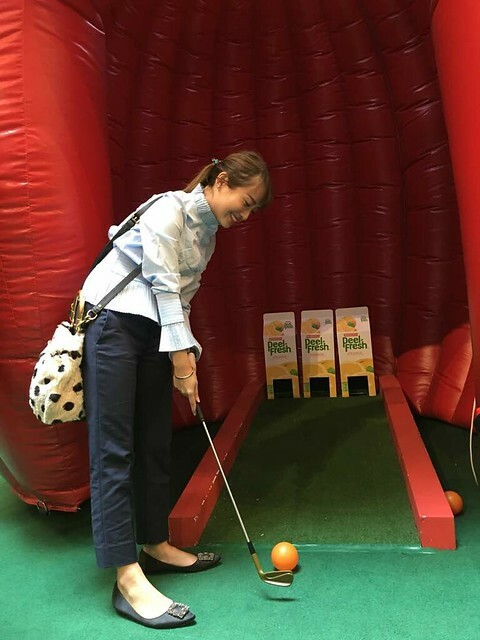 Super suay, you get three turns and I failed to hole in one any of my three balls. But then when I posed for this picture, I successfully hit my orange into the hole cis hahaha. No surprise there but the critters’ favorite out of the 9 Marigold Peel Fresh flavors is Mango. There is also a No Sugar Added range with 6 flavors – Orange, Apple, Cloudy Apple, Mixed Powerberries, Mixed Powerveggies &amp; Fruit, Mixed Fruit Mangosteen and their newly launched Mixed Kale & Veggies. All Peel Fresh juices are fortified with Vitamins A, C, E and antioxidants. 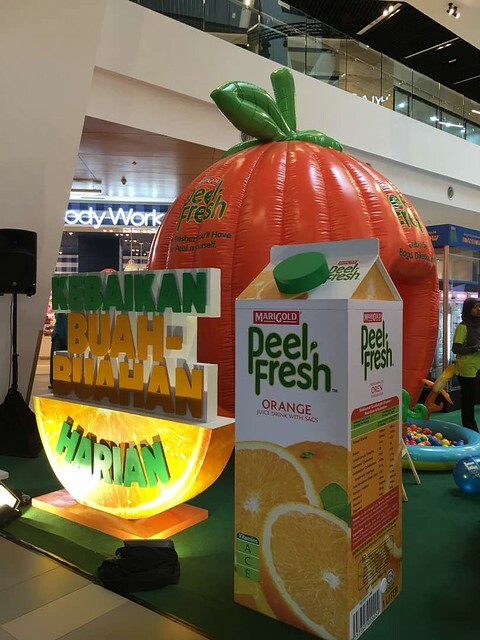 This post was written in collaboration with Marigold Peel Fresh.